One woman’s brave journey through heartbreak and loss results in finding everlasting love and healing through Adoration. On August 6, 2009, my sister Jeanne DeCarolis passed away. It was very sad to see a young woman of only 54,who used to be so active in sports, so full of life, die such a horrible death of bone cancer! She always took such good care of herself. I continued to ask myself “why?” We had lost our father at the age of 67, to Leukemia, and now, my sister at the young age of 54! To make matters worse, my Mother then became ill and she could not maintain her weight. She asked me to visit with her, and I did that as often as I could, because of all the time I was spending with my Mother, I did not have as much time to see my boyfriend, who I had been dating for 5 years. I was mourning my sister, and now trying to console my mother. I thought my boyfriend understood how emotionally exhausted I was, how stressed out I was, and how heartbroken I was, but I was wrong about him. Since I was too tired to see my boyfriend the next day, he decided to make plans with an ex girlfriend who he had not seen in 35 years. I wasn’t really worried because he had often told me that 35 years ago, she had cheated on him and broken his heart. That evening, I called him and he did not call me back for 4 hours, which was making me very worried. Finally, at 11:30pm, I got the dreaded call. He told me he met with his ex-girlfriend that day, and he said they went out to dinner and then she took him back to her place. To ease my worry, he told me nothing had happened, and they had just caught up on old times. He then asked me if I wanted to meet her and I said, “of course”. The next day, I went to his house and my jaw dropped as he explained to me that he loved us both, wanted to marry us both, and he was seriously considering becoming a Mormon. He took out his Mormon Bible to show me that a Mormon can have two wives. I was shocked over his bizarre behavior as he had always been a Catholic! Obviously I was very upset, and I did not know what to do or how to react. This man was supposed to love me, to be my life partner. His ex had broken his heart, and now he wanted to marry her! I became sick with grief, shock and heartbreak. My mother and my son began to worry about what all this emotional stress was doing to my health. Thinking exercise would help clear my mind and ease my pain, I started to walk my dog a mile, two miles, and then six miles per day. As I walked, I tried to draw strength from my Catholic roots, and recited scriptures from the bible. Worried about me, my neighbor and friend suggested I go to the Eucharistic Adoration at St. Williams Church in Tewksbury. Mass. I decided to go, but when I got there, I did not understand the setting at the altar. I was told that Jesus was in the Eucharist. The Eucharist, I learned is where the Catholic Church consecrates the bread and the wine. The teaching is that the bread and the wine are the “host” and become, the body and blood of Christ. I went with my mother and we stayed for the hour. 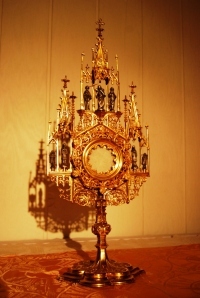 I felt drawn to the Eucharist, and started to go to Adoration every day. 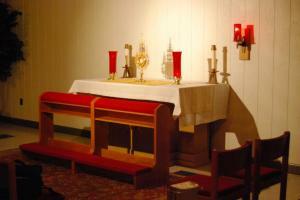 I found going to Adoration very comforting and peaceful. I began to feel more and more drawn to this sacred Eucharist. After years without really following religion, I started praying and bought myself the Catholic bible to read while I was in there. I was beginning to feel better, but each time I left Adoration I cried in my van in the parking lot. I met a very nice woman one day when she thought it was her turn to watch the hour. As it turned out, she had the days mixed up. I told her my story and I broke down and cried. I told her how hurt I was, and what was happenning with my boyfriend. She said if my boyfriend loved me as much as I loved him, he would not let me suffer like this. She was right, because it was then I realized he indeed had a cold heart even after our five year relationship. I was hurting so much because I had lost him to this other woman, worse yet one who had already broken his heart once. I knew I loved him more than she ever could, and I was so torn up inside over the betrayal of trust. The woman I met at Adoration told me to read about Tobit in the Bible, and read a scripture on St. Raphael. I read both stories, and began to gain some more understanding. The woman then told me that in order to heal, to get over my pain and the betrayal, that I had to give my boyfriend to Jesus. She was very clear about this, and I knew that I could not do it. I could not stop crying over the fact that I had to offer him to Jesus.I did not want to lose him, I loved him so much. I wanted to share my life with him, forever. How could I just let him go? She said, “Ask Jesus to take the pain from you so that you do not have to suffer anymore”. I cried so much I was embarrassed with myself over the incident. She asked me if I had Rosary Beads and I let her know I had my Grandmothers and Grandfathers. My Grandmother gave me those beads a few weeks before she passed away, in 2002, and told me her husband prayed 3 times a day to the Rosary. I never knew any of the prayers for the beads and put them in my dining room hutch. She had to leave, so I stayed behind at Adoration, lost and confused. It took me a good long time to come to terms with the fact that I had to let him go. He was already gone to me anyway. He had betrayed me, he wanted a life with this other woman and there was nothing else I could do. I had lost him, and holding on to the pain was destroying me. I took everything in me, but in a moment of raw faith, I finally asked Jesus to take him from me. Right after I did this, as I left Adoration, instead of getting into my van and crying, I walked out to my van and left with a smile on my face. I did not know or understand at that point what was happening to me. I just knew I felt better. A wave of relief came over me, a release of pain if you will. It all happened so fast, and yet I felt the result immediately. I felt as if God had laid his hands upon my shoulders and told me “everything will be ok.” I drove home, and took those beads out of my dining room hutch, and went online to look for the prayers for the Rosary Beads. I began my first prayer with those beads on the couch. This feeling lasted for about 3 weeks. I then started to feel sad, and was told by the same woman to go back to the altar and ask Jesus to help. I did just that and within the next morning I had the most inner peace ever! It was Thanksgiving day, and my brother was cooking for the family at his house and my family could sense my inner peace, and my glow. My mother and my brother thought I was a completely different person. I felt completely at peace and had the most beautiful feeling of my life. I still have this feeling, and it continues to get stronger each day. The more time I spend at Adoration, or just attending a schedule Mass, the more blessed I feel. Jesus has changed my life completely. I am closer to Jesus, I pray often, I can’t stop talking about my blessings. I share it with others, I encourage people to pray to your rosary as well as spend time with the blessed Sacrament at an Adoration. I realize now that everything in life happens for a reason. I needed to find myself and I did through Jesus. I believe the Eucharist at Adoration saved my soul. It has enriched my life and taught me to love myself. I now put God first in my life. He has changed my life and I would not trade this feeling for anything in the world. Just an hour with Jesus…. “Let the Light In” and may Jesus give you the same inner peace and love he’s given me.